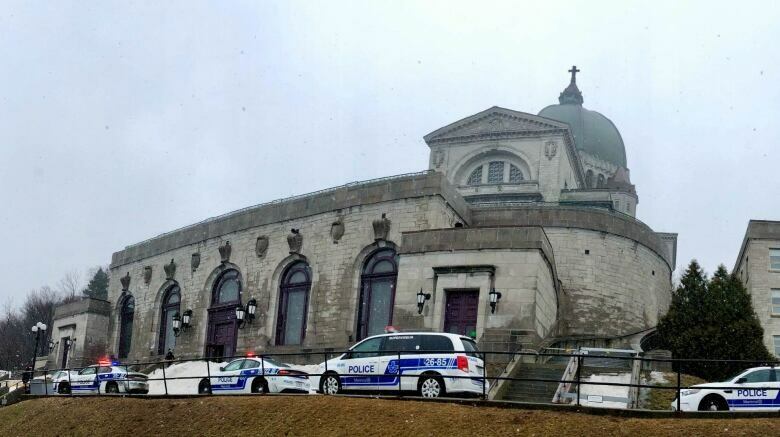 Adèle Plamondon says she'll be back at Saint Joseph's Oratory first thing in the morning after a priest was stabbed during mass on Friday. 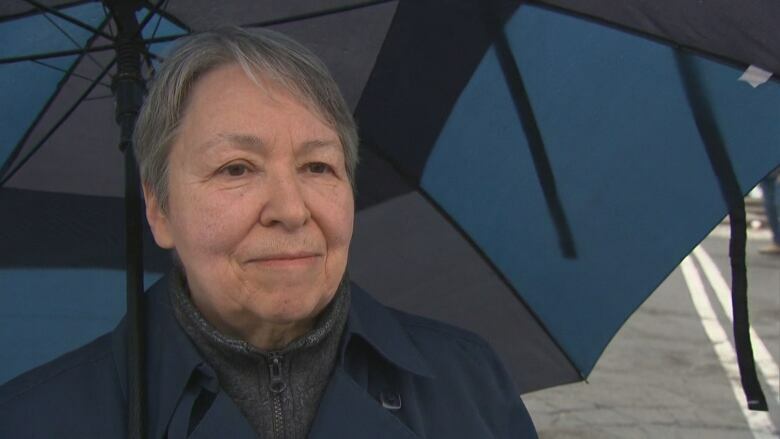 Adèle Plamondon says she'll be back at Montreal's Saint Joseph's Oratory first thing in the morning after a priest was stabbed during mass on Friday. 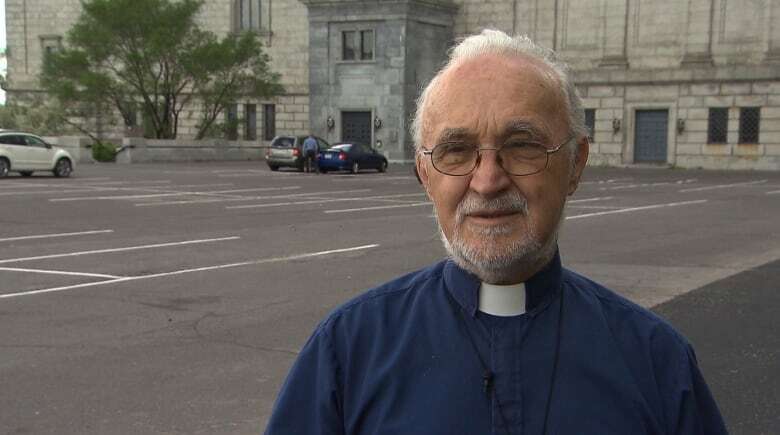 Father Claude Grou was stabbed in the chest Friday while delivering morning mass, which was being live-streamed online, suffering minor injuries to his upper body. A 26-year-old man is in custody. Plamondon had just finished the day's church readings when she saw a knife-wielding man climb the steps of the altar and approach Grou. She told As It Happens guest host Susan Bonner what happened next. Here is part of their conversation. When did you realize that there was something wrong during mass [Friday] morning? When the assailant ran close to the altar in front of me, taking a knife out of his pocket. How close was this man to you? And you could see the knife? Oh yeah, he took it out of his belt in front of me. I was on the side of the altar because I was doing the reading of the church. I saw him there. We had just finished singing the psalm, and I saw this man coming in the middle where you could go up to the altar to where he's not supposed to go at all. And I thought he was just going to pray, kneel there and pray, but he did not. So then right away, I realized something was wrong because he was not allowed to be there. When he was going up the steps, I saw him pull his jacket and take that big knife out of there and just going for Père Grou. And at that time, I raced out to the sacristy, yelling my head off to attract the security. And he came running out of this office, and I said, "They're attacking Père Grou! Somebody is attacking Père Grou with a knife!" He raced out and I stayed in the sacristy. I did not go. So I did not witness the attack itself. Père Grou came down to the sacristy and then I saw his wounds and they were superficial, hopefully. That's what I saw. How did Father Grou seem? He was able to walk. They walked him out from the church there, and they sat him in a chair. He was in shock, but he was coherent. He was talking. He was very calm. People were all asking him "Are you OK? Are you hurt?" and he said "I don't know." We saw a little dot of blood and said, "Oh, you've been hurt, Father Grou." So then we removed his T-shirt and saw the gash there on the right side, where your appendix is. Listening to you describe being right there and seeing the assailant and then seeing Father Grou come back with his injuries — how are you processing that now? Some journalists asked me after, "Would you go back to the church?" Definitely. Definitely. It's got nothing to do with feeling insecure in the church. You can be rammed in the street by some crazy nut, you know, with a car or a truck or what not. You can be attacked in the metro. And for this to happen just one week after the attack at the two mosques in New Zealand, how are you thinking about that? That's what I mean by hatred, you know? You don't know who, where, when and how. It can be the church. It can be a mosque. It can be on the street. Hatred is in the air. For whatever reason, somebody has got something to gripe against someone. Father Grou spoke out about the attacks in New Zealand, and he called for peace and harmony. And I think he used the words "despite all the difference." How was that message received? Were you there when he said that? No, I was not. But I would agree with him wholeheartedly on that and make that very statement mine. What do you think, just one week after his message of peace, he's violently attacked on his altar? What can I tell you? Did this person choose to come at that time because he knew it was going to be broadcasted live and that's what he wanted? Like the guy did in Christchurch in New Zealand, filming the full horror there? You know, what can I tell you? Do you think that St Joseph's will will review its policy of broadcasting mass live? No.You do that, then you play in the hands of all this hatred. You continue living like the people did in the mosques. You just try to preach love and forgiveness and pray for those people that have so much hatred that they feel they have to do such a thing to get attention or whatever. They're the ones that I feel sorry for. They're stuck into that hatred. When will you go back to St. Joseph's? Go and thank God for saving Père Grou. And I will definitely pray for the assailant too, because for him to commit something like that, God knows what he has suffered. Written by Sheena Goodyear with files from CBC News. Produced by Jeanne Armstrong. Q&A has been edited for length and clarity.